Each kit contains an ISO laboratory test chart and 100 test sheets. Each test sheet contains six different fluid tests (Brake fluid, Power Steering fluid, Transmission fluid, Motor Oil, Transfer Case, and Differential). This is not a color test! It is a patented radial planner chromatographic fluid test that measures the amount of sludge in a lubricant or oil. FluidRx testing provides simple and accurate verification that a fluid should be changed. Simply place a drop of the sample fluid or lubricant on the FluidRx filter paper, then compare the findings to the FluidRx ISO analysis chart. 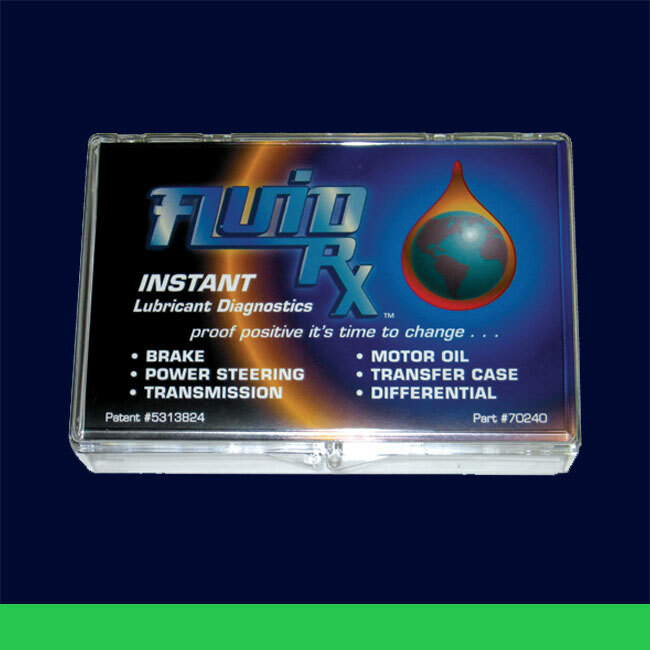 In seconds FluidRx provides and analysis of crankcase and gear oils, power steering, transmission and brake fluids.